Am I right in remembering Almunia being brilliant at penalties? I remember a cup game against one of the Sheffield's and he saved a few in a penalties shoot out. One vs Roma a few years back in a penalty shootout. Foreign mate. All foreigns are technically superior to their English counterparts. I don't think we are getting 4th. We're going to be the horrible ***** that relegate Wigan. Walcott to score an early goal. Whilst Spurs score late goals, we score early ones. Only good result for us around the grounds today was the newcastle win, at least when we play them they will no longer be fighting for their lives! Assuming we beat Wigan Athletic Warriors of course! Napoli, Galatasary & Porto in the Emirates Cup apparently! Would be excellent. Galatasaray can **** off. Terrible move by the club, I hope it's the lowest attended Emirates Cup. Are you referring to them like that due to the incidents with the British people? Wtf would you want to post that in here? No, he had a terrible Kebab last night. It's amazing that we've gone on such a good run and yet we still need to win our last two games. Shows how crap we were earlier in the season. I just really hate Turkish Delight mate. OR I'm against it due to the horrific scenes in Copenhagen back in 2000. You decide. Good to see goon back. How is Lupoli doing these days? But I'm sure he's terrifying defences with his blistering pace. 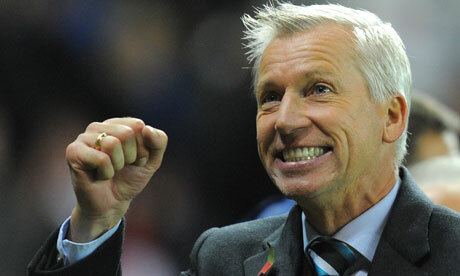 Pardew apparently said he doesn't care if we beat them 4-0 next weekend. Pardew is such a horrible ****. I'm glad he's taking that attitude though. Quite worrying to think that he'd probably make the bench in our side atm. Agreed, seems like whenever they play an English club their fans use it as an opportunity to act like animals. Also, Porto and Napoli are exciting vibrant teams who I'd enjoy watching. Galatasaray are mostly washed up old has beens+Emmanuel Eboue+anonymous Turkish players. But I suppose the teams involved usually change before its all finally arranged, so hopefully it'll be Galatasaray out, Atletico Madrid or similar in. I think they may have found their level in the reserves. I don't know about you, but I'm so nervous about the Wigan game, I think I'm going to be sick. The thought of losing, and what it means, is just sickening. You better win tonight! C'mon Arsenal. Always been a fan. Yeah, it's a huge game for us. It's not even one of those situations where I'm expecting us to win but fear we might not. I'm not even expecting us to win... I'm just hoping we do. So nervous, this is the kind of game that we screw up all too often. As long as we don't become our own worst enemy (like we often have) we'll be fine. I'm confident we'll win... and against Newcastle. I have faith in the team, I know we can beat both, but I'm still ******** it. I'm actually more scared about the Newcastle game, as I know that scumbag Pardew will do everything possible to stop us winning. Still e-ffing nervous tonight, and I have food poisoning so the nerves aren't helping my stomach. Podolski starting Oh dear. I'm sticking by my 0-0 prediction. All worth it if we get to celebrate St. Totteringham's day again. .
On the toilet now! Hopefully ready in time for kick off. I don't know why we get ourselves in a good position then decide to be inept for the last 20 minutes of that half. How is Mike Dean still allowed to referee our games?